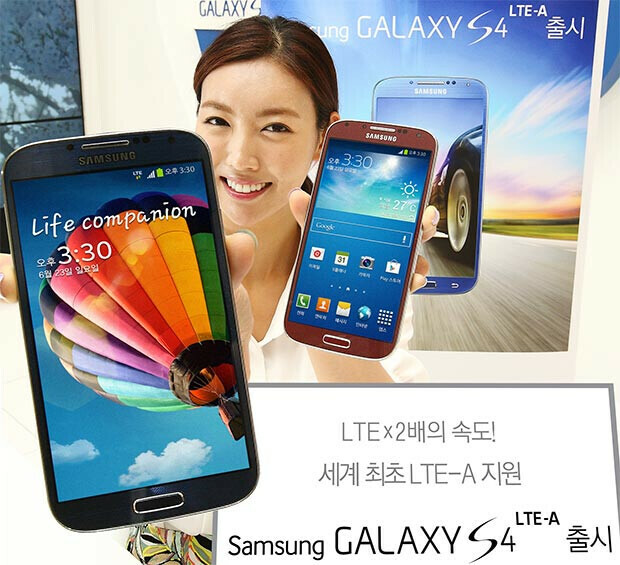 On Tuesday, we showed you pictures from an unboxing of the Samsung Galaxy S4 LTE-A. This is no ordinary version of the flagship Android model, but is equipped with the zippy Qualcomm Snapdragon 800 and features LTE-A connectivity. The quad-core processor is clocked at 2.3GHz and supports the 150Mbps data speeds possible with the next generation of LTE. Earlier this year, Verizon said that the Samsung Galaxy S4 on its lineup can be updated to work on the LTE-A pipeline that eventually will be used by Big Red. The model just introduced by Samsung will be available at first in Korea only, destined for the LTE-A pipeline belonging to SK Telecom that is being built out faster than originally envisioned. The device will be available in two colors, Aurora Red and Arctic Blue and offers the same 5 inch display with 1080 x 1920 resolution. There is 2GB of RAM with 32GB of native storage, a 13MP front-facing camera and a 2MP snapper on back. A 2,600mAh cell powers the phone which has Android 4.2 pre-installed. If you don't live in South Korea, there is no need for jealousy. 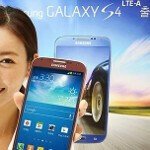 The Samsung Galaxy S4 LTE-A will be launched internationally in the months ahead. Damn Samsung, always innovating. Great job. And trust ME, that's not the proper use of grammar. Also, just going by what you just mentioned, what would you consider innovation? I'm not taking sides here, but I'm just curious what manufacturer out there is REALLY innovating? I would be the first to say that I believe Samsung has become more stale when it comes to innovation, but I'm just curious as to which manufacturer you believe is innovating. I will agree with the Sony and HTC part. Sony use to be the followers of the pack, but starting today they have become the leaders of the pack in some ways. If they release the i1 with the rumored features and specifications then I would say they are definitely the leaders of the pack. However when it comes to Nokia, I must say they are becoming stale in innovation like Samsung has. If you think about it, the most innovative feature they have created deals with their cameras, but they haven't really innovated in that field for over a year now. For instance, the only notable feature on their new Lumia EOS (or 1020) will be the high megapixel camera that will use the same sensor found in the Pureview 808. All they did was take the camera technology they have had for over a year and put it inside of a thinner device running Windows Phone 8. What we are seeing is Nokia facing stifled creation because they chose to go with Windows as their operating system of choice. The only thing they can really innovate with deals with the camera or screen technology. Imagine if they had stuck with an open-source OS like Meego that would've allowed them to innovate a wide array of different hardware and software items. The Lumia 925 is a slim device IMO. Build quality is not an innovation, it is merely just a measure of how well a device is held together. You are right I normally wouldn't assume something without it first being announced. However, as I have mentioned before, the only features Nokia has control over is the design and camera. I am fairly confident that the design of the new Lumia EOS will be derived from the Lumia 920 or the latest 925 with some minor changes. As the commenter before as noted, the OS is not a Nokia innovation. They have no real control over how the OS operates. I'm glad you mentioned design and how you own a Lumia 920. I first off want to say that I enjoy Nokia designs. I think they are simple and clean looking. However, I believe Nokia has, again, become more stale in that department. I want to point out that when I mentioned in my original post about manufacturers going stale with regards to innovation, I was not saying that they haven't or will not produce something innovating. Instead, I was saying that they haven't produced something that is truly innovating or something that isn't just a minor upgrade of some old feature or design language. The Lumia 920 was the exact same design as the N9 (although in my opinion it is uglier than the N9 because the bottom half of the phone is taken up by the Windows buttons that weren't there in the N9). The Lumia 928 and the new 925 pretty much took that design language and tweaked it just slightly so you could say it was a different design but it didn't really incorporate a brand new design language. That to me is stale innovation. It isn't up to the standards Nokia placed for itself only a a few years ago. I want the innovation that brought about the N9, a device that was truly revolutionary and yet under appreciated at the time. Are you the REAL Dr.Phil? How does this add innovation on Samsung's part? Because it has a S800? Yeah, great job *Qualcomm* for making such a powerful chip with LTE-A capabilities! Well, the Snapdragon 800 wasn't available for commercial use in March when they announced the GS4. If they had gone with the Snapdragon 800, that would mean they couldn't release the GS4 world wide until just now, which would've had a huge impact on sales. They shouldn't have made a GS4 with the S800 to begin with, and should have just stuck with the S600 and Exynos 5 Octa. "13MP front-facing camera and a 2MP snapper on back." or is it the other way around? Which device doesn't get outdated nowadays? The S4 was announced in March and it's almost 4 months since. Tech companies won't slow down for you. If you're worried about updates, get a Nexus. All OEM-skinned devices have added value with their features that more than make up for the delayed updates.